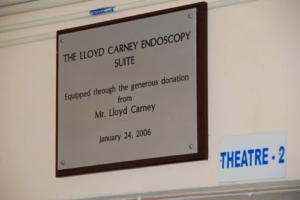 CGV donated endoscope equipment to Black River Hospital, Jamaica for the operating theatre. This equipment, as configured, allows for doctors to be trained on endoscope procedures. It provides for less intrusive diagnostic, as well as surgical, procedures. This equipment reduces recovery time for patients and improves the effectiveness of their treatment.